Lots of people talk about ‘greening’ their lifestyle and ‘getting back to nature.’ But have you ever thought about this from nature’s perspective? The plant world has never lost its connection with us. We humans are the ones who are culpable for the great disconnect between our species, by dominating the plant world instead of co-existing respectfully with it. If we listen, plant intelligence provides profound insight into ourselves and our world. Imagine the power of not just passively being around plants, but truly interacting with them in a way that you can understand. If you love plants, nature and music, you will savor this event with Tigrilla Gardenia, an Interspecies Researcher and Ambassador of Damanhur Spiritual EcoCommunity, www.damanhur.org, an eco-community in northern Italy. Tigrilla will be sharing her experiences with the effect of plant music on healing and more, and as a special treat, she will be holding a mini-music concert with plants, so feel free to bring your instruments and/or plants! Using Music of the Plants as her main research tool, Tigrilla is working to reset the matrix between plants and humans. 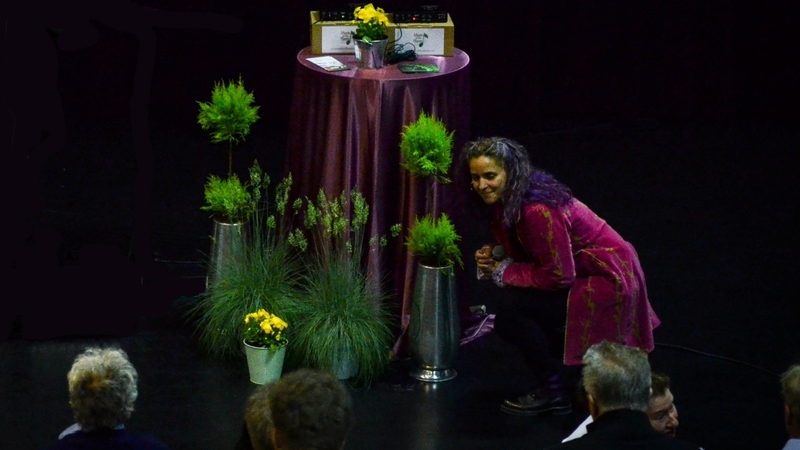 Her research shows that when this connection is strong, plants create music that can heal disease, release chemicals to end depression and create opportunities for unity in dense cities. Come ready to be astounded by what you will learn about interspecies music and true co-creation with the plant world. Science shows that being around plants and trees, both indoors and outdoors, significantly improves our physical, mental and emotional well being. Plants in homes and workplaces help to reduce stress, increase productivity, enhance employee attitudes, lower operating costs and improve air quality. A personal connection to nature inspires us to create a world where the environment doesn’t need protecting because it is an integral part of who and what we are. Doctors and holistic health practitioners alike are actively researching the effects of the Music of the Plants in numerous settings—including home, hospitals and the workplace—to better understand how plant music shortens recovery time and aids in overall healing. Based on recent empirical and scientific studies, we are learning that plants can identify illness and make music to deconstruct a disease and reconstruct a remedy. Doctors and holistic health practitioners alike are actively researching the effects of the Music of the Plants in numerous settings—including home, hospitals and the workplace—to better understand how plant music shortens recovery time and aids in overall healing. If you would like to try this cutting-edge research for yourself, book a private session of Plant Music Healing. Sessions are individual by donation and can last up to 45 minutes. You will be asked to fill out a short questionnaire at the end of your session. Contact Linda Frank to book a session with Tigrilla and the Music of the Plants.